The Term Betty refers to a gal who is Attractive, Stylish, & Confident. & at select Sephora Stores. As a Professional Make Up Artist, I am used to owning a lot of Black pieces. I recently got my hands on Micheline Pitt's new Clothing Line VixenByMichelinePitt. When I first saw the digital art work of these beautiful peasant inspired tops, I knew I needed them in every color they came in; including black. The Powder Puff Top has these adorable Large Puffy Sleeves are Gathered so they can be worn Up like shown above, or you can show some skin like a Veronica by wearing the sleeves off the shoulders. The Bust section is gathered & gives ladies the options to show Major Cleavage or Keep your Look Work Appropriate. It is made out of Custom Knitted Heavy Cotton Spandex, there are no Zippers & No Buttons so you can easily slip it on & head out on Route 66. One of the most important selling points on these beauties were that they were long enough to wear over your High Waisted Jeans or Tucked in your favorite Swing Skirts like I chose to do. When you sit down or bend over to pick up your child you won't have to worry about it bulging up in the back. 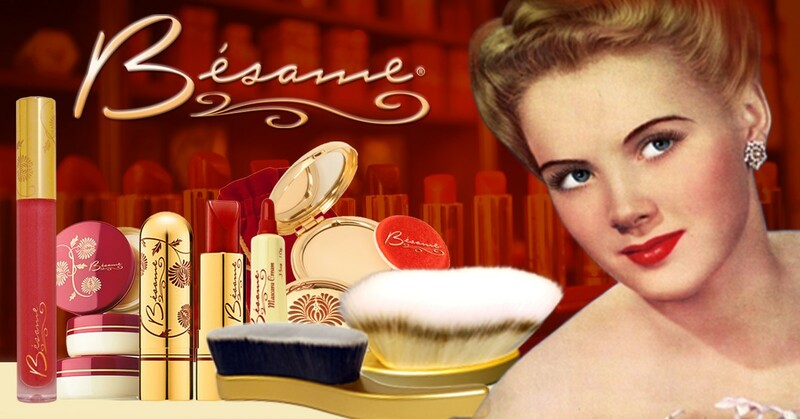 To achieve my 40's/50's inspired "Classic Beauty" look, I went to my favorite Vintage Inspired Cosmetic Company BesameCosmetics. I used their 1920's Cake Mascara Three Different ways; to achieve beautiful sculpted lashes, bold arched brows, & a classic cat eye just add a bit of water to your Cake Mascara & start applying. Finish your look off with your favorite Bright Red Lipstick & you are ready to grab a Milkshake with that lover boy! 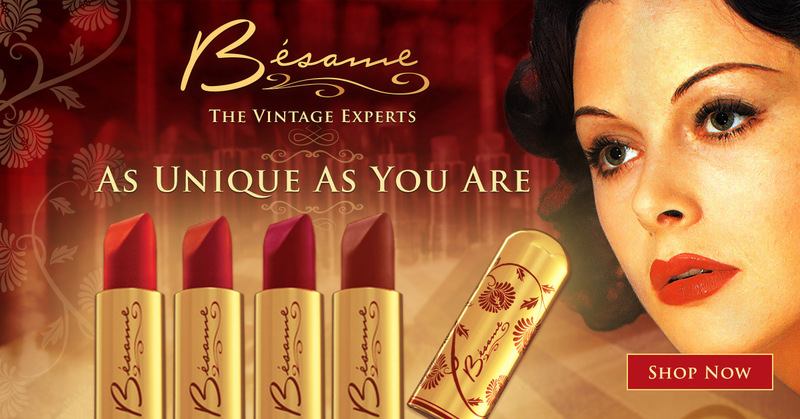 1920's Besame Red Lipstick also by BesameCosmetics. 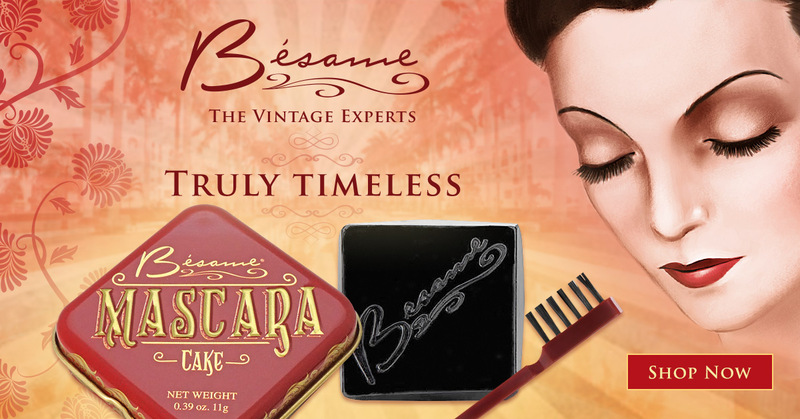 1920's Cake Mascara & Achieve this Classic Beauty Look. Every Betty needs a Poodle Cardigan to help achieve that Classic 50's look pair it up with your Classic Black Swing Skirt & you are ready to hit the Jukebox & Swing the night away! I have always been a sucker for those Vintage Poodle Skirts, & adorable little Cardigans to match. I recently purchased this Powder Blue Poodle Cardigan from a shop called MissLadyBug.CA she has such adorable 50's Vintage Inspired designs that pair up wonderfully with my favorite pieces from Vixen By Micheline Pitt. This is my first Classic Black Swing Skirt, the Classic Vixen Skirt from Vixen by Micheline Pitt is Fully Gathered & has Waist Band that hugs your curves & gives me that HourGlass Silhouette. As a Petite Little Lady I usually need to get skirts altered because I am only 5'1, my Vixen skirt is a X Small & the length is perfect for me it stops right at my calves which I personally prefer. It has deep pockets that I can actually carry my iPhone 6 Plus inside without having to carry my purse everywhere. The Material is made out of Heavy Weight Stretch Cotton Sateen & allows for a bit of stretch.Since the skirt is fully gathered you do not have to wear a petticoat to achieve that fullness like how women would wear their circle skirts in the 50's. If you do love Petticoats it does look even more amazing & full.